Slice onion quarters into thin slices (should yield about 6 cups). In a large stockpot over medium-low heat, melt the butter in the pan with the oil, add the onions and stir to well coated. Reduce to low heat, cover and cook for 15 minutes. Increase heat to medium, stirring in salt, pepper, thyme and sugar; cook additional 20 minutes uncovered, stirring often, until the onions are a golden brown. Reduce heat if necessary. In another stockpot, heat the broth; remove from heat just before it begins to boil. Stir in sifted flour to the caramelized onions and cook for about 1 minute. Reduce heat to low and add the hot beef broth to the caramelized onions and bring to a boil and cover partially. Cook for 45 minutes or until the broth is slightly reduced. Season with additional salt and pepper if needed. Heat the oven to 350 degrees. Divide the soup between deep oven-safe serving bowls. Top each with a slice of toasted baguette and sprinkle cheese in a thick layer over the bread and edge of the bowl. Place the bowls on a baking sheet and bake until the cheese is thoroughly melted, about 5 minutes. 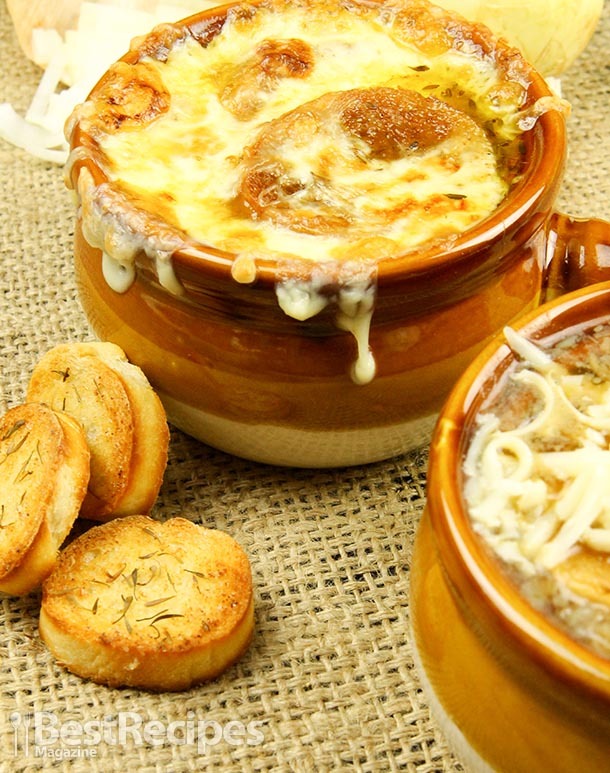 Once the cheese is melted, set oven to broil and broil soups until cheese is browned and bubbling, about 1 to 2 minutes. Slightly cool before serving.